- Don’t stuff your kid’s bedroom with too many decorative features. Allow them sufficient space to move around comfortably. 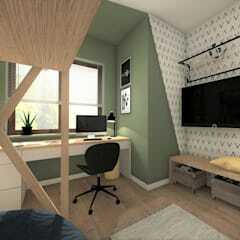 His room should have all the essentials of decor, but avoid designing a cluttered space at all costs. This is important for the wellbeing of your little one. - Don’t undermine his preferences. If he has some ideas of his own, allow him to share those ideas with you. Include those features that are possible to have in the room. When rejecting one of his ideas, make him understand why you are doing so. - Keep the age of your child in mind. A room for a toddler would have a different design than a room for an 8 year old child. - Insist on designing a safe and secure interior. Don’t keep electrical cords hanging about the room. - Use child lock in the windows and doors. If the room has an adjacent terrace, secure it with stylish grills. - Cover the flooring with plush and stylish rugs. It will prevent him getting accidentally hurt in case of a fall. 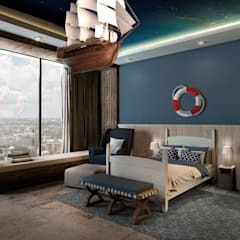 How can I design a boy’s bedroom? 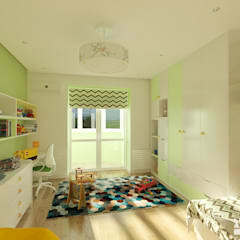 Generally speaking, a relaxed modern style seems to be most suitable for a child’s room. 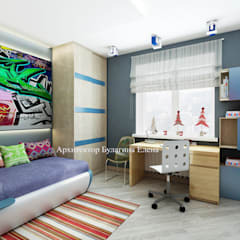 While searching for boys room ideas, keep a close watch on modern bedroom decor. Modern bedroom furniture and decor items tend to be easily available and more cost effective. Some of the other preferred styles include Scandinavian and classical designs. 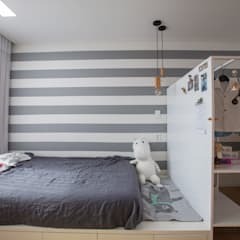 Scandinavian boy’s bedroom decor is minimalist in nature, so it is easy to keep the interior clutter free. It remains in sync with the other parts of the house or apartment. In local stores in Singapore, you will easily find trendy Scandinavian furniture and decor objects. You may also buy these items online. 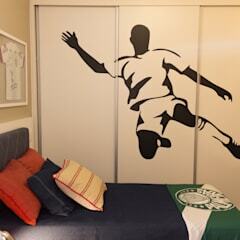 Sports – Design a room keeping in mind your child’s favourite sports or sporting icon. Does he love playing tennis? 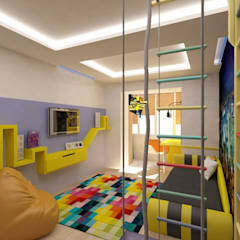 Then decorate the room with a white and yellow colour scheme. You may choose mural wallpaper with images of Wimbledon centre court and decorate the feature wall with it. A large poster of your child’s favourite sportsperson may also be put up on the feature wall. What are the most suitable colour schemes and patterns for a boy’s bedroom? 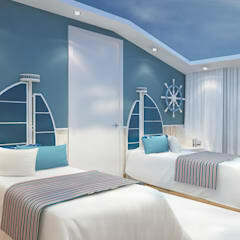 Colour schemes made prominent by shades of blue and white seem to be the most preferred choice for a boy’s bedroom. However, there are many other tones that you may easily integrate in the scheme of décor. Combination of white, dark grey and yellow seems striking for a minimalist bedroom. You may also try earthy colours and balance them with fiery orange or accents of red. If you are going for a theme based décor, then choose colours based on the theme. Bold patterns with geometric motifs like stripes and squares look better in a boy’s bedroom. What furniture is needed for a boy’s bedroom? - A comfortable platform, Trundle or bunk bed. If availability of space is not a big factor, bring home a platform bed. It is the most durable and comfortable type of bed to have in this space. - Shelving system to store away his play items, books, craft and hobby materials. - Wardrobe to store his clothes. You may opt for a built in wardrobe. It will save space in the room. - A study table and chair. 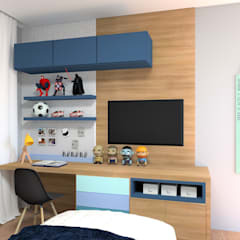 A quality boy’s bedroom set which includes a platform or Trundle bed, wardrobe, study table and chair will cost you about SGD 3000. 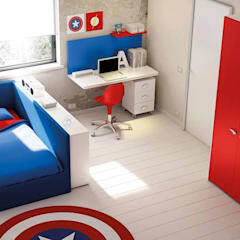 How to decorate a boy’s bedroom? Install lighting fixtures that are capable of sufficiently illuminating the entire room and increase the appeal of the interior. Many modern wall sconces, pendant lighting and desk lamps work as a piece of decorative art. Choose the correct bed furnishing for your kid. It should be comfortable to use and easy to clean. Cotton and linen furnishings are considered to be the best options for this space. Invest in matching curtains and upholstery. You will easily find fabric with kid friendly motifs. Use framed photographs and paintings to decorate the walls. How to augment the storage area and optimise space in a boy’s room? Invest in furniture that are lightweight and takes little floor space. 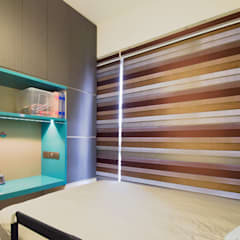 Wall mounted shelves and wardrobes are great for freeing up floor space. Buy a bed with under-bed storage space. You may also invest in a custom designed headboard with additional storage space. Instead of standalone tables, buy wall mounted platform tables. 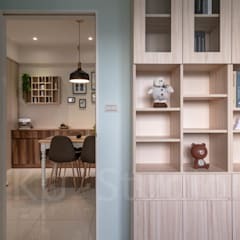 You may also speak with an experienced interior designer right here on homify and seek suggestions of optimising the space in your child’s bedroom.